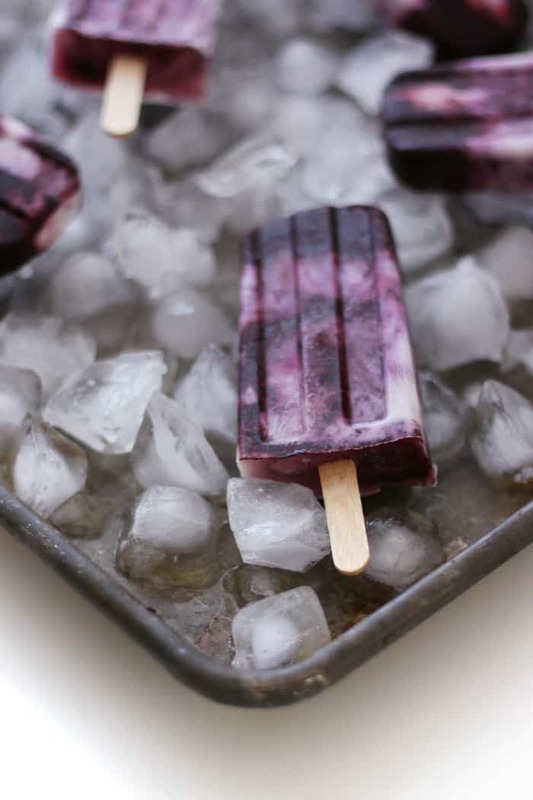 Sweetened with vanilla and honey, swirled Blueberry Yogurt Popsicles are the answer to hot summer days. Even though I know the weather is not going to cool off anytime soon (it will in, like, October), I am seriously savoring every drop of summer. This one has been an extremely busy one, but a really, really good one. 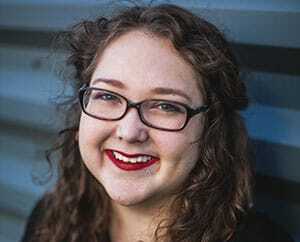 I know it’s been quieter in my corner of the Internet, but, to be fair: I traveled a lot in June, attended an important family wedding, had a 7-week visit from my sister who lives overseas, tackled some awesome freelance projects and made some excellent new friends. Things seem to be easing up a bit and I’m settling back into a new but more normal routine. I’m so excited for autumn to get here (I see you, scarf weather!) but for now I’m enjoying sunglasses-worthy afternoon breaks in the sun with something cool to snack on. Lately, it’s been popsicles. It’s been a while since I got out my popsicle mold. 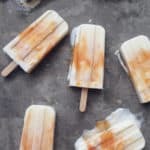 Remember these Irish Coffee Popsicles? Or how about these Peaches & Cream Popsicles? 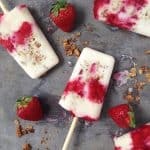 Or, my favorite, these Yogurt Parfait Breakfast Popsicles. 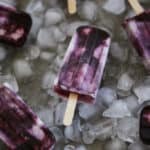 Today I bring you Swirled Blueberry Yogurt Popsicles. To make these babies, take your juiciest farmer’s market blueberries. Blend them with honey. Then, layer the two mixtures in your popsicle mold and swirl them with a creamy mixture of yogurt, honey and milk. Pop in some popsicle sticks and freeze them. Give them a day and you’ve got a luscious frozen treat worthy of an afternoon break outside. 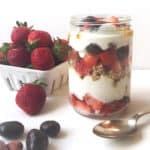 By the way, one of the cool projects I’ve been working on is making videos of some of my recipes. I won’t do this for every new recipe, but the plan is that you’ll see them here more often. I’m super excited to be partnering with my friend Chris to put these together and help you visualize the process of making my recipes. Okay! 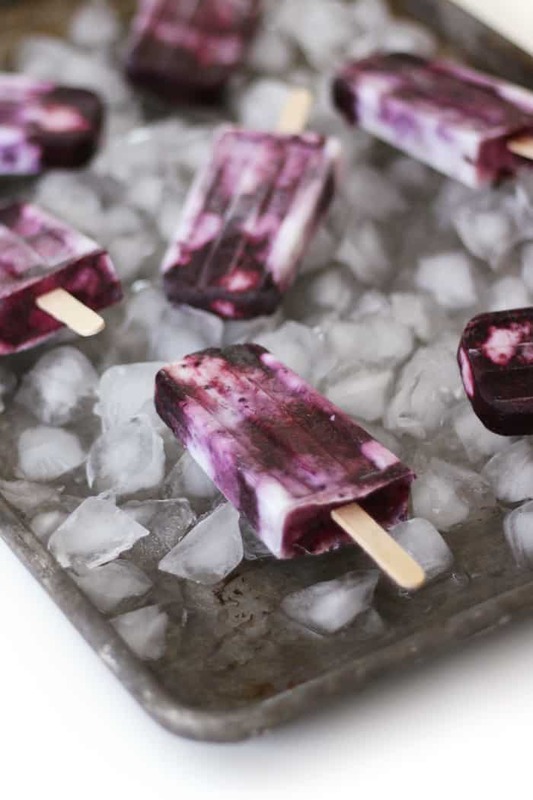 Now may I present my first-ever recipe video for these Swirled Blueberry Yogurt Popsicles. This post contains affiliate links. If you click on one and buy something we receive a small commission at no additional cost to you. All opinions are those of the author. Video by Chris Henry Co.
Mmm! 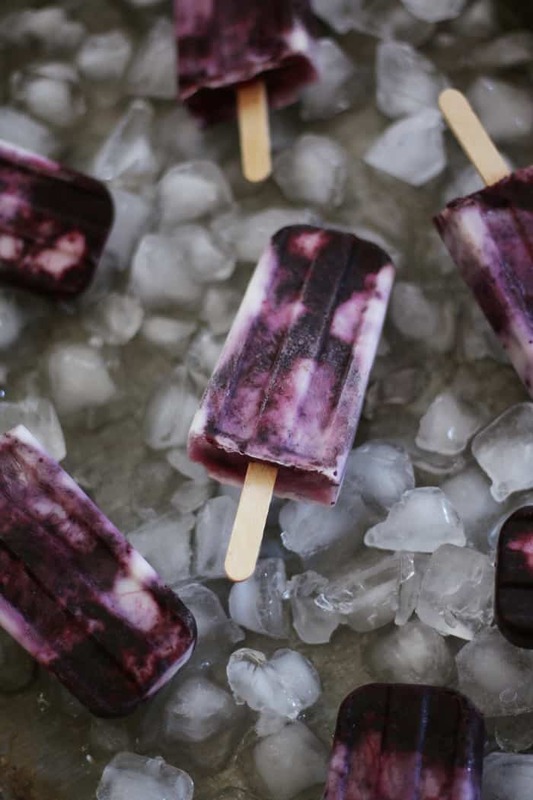 Swirled Blueberry Yogurt Popsicles are the answer to hot summer days. Place blueberries and 1/4 cup of the honey in a blender. Puree until smooth. Place a fine mesh strainer over a medium bowl and pour in the blueberry mixture. Let the liquid separate completely from the seeds and solids. Discard the seeds and solids. In another medium bowl, whisk together yogurt, cream, remaining 1/4 cup of honey and vanilla until smooth. 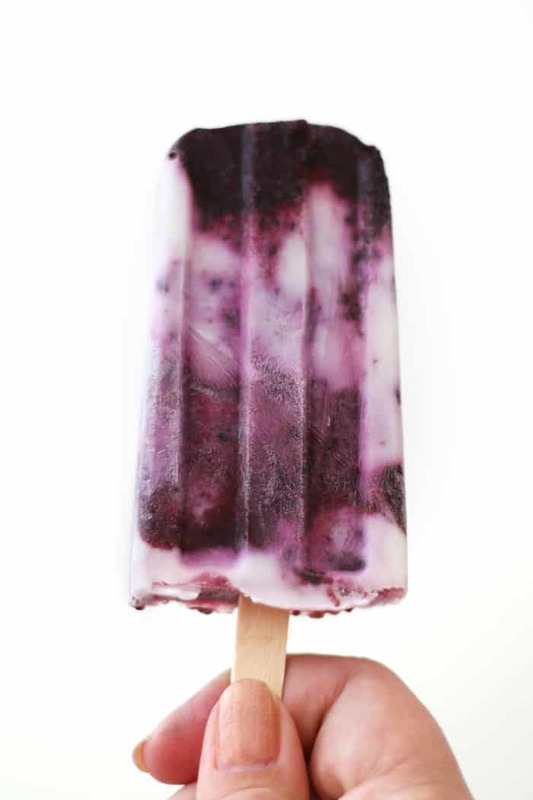 Into a popsicle mold, layer the blueberry mixture and the cream mixture. Using a skewer, straw or popsicle stick, gently swirl together the layers. Add popsicle sticks and freeze 2 to 3 hours. 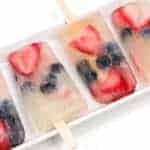 Use lukewarm water to set popsicles free from the molds. Store in zip-lock bags and keep frozen until ready to eat. 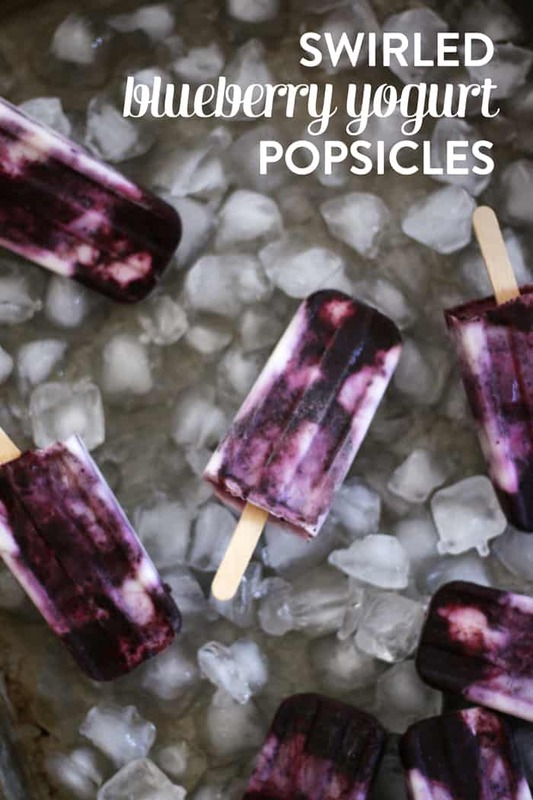 I totes want one (or many) of these popsicles right now. These are definitely what we need to stay cool this summer. Summer is the WORST. I love Popsicles to cool down. Sorry for the delay in my reply!